The National Weather Service has issued a WINTER WEATHER ADVISORY IN EFFECT UNTIL 10 AM EST THIS MORNING. 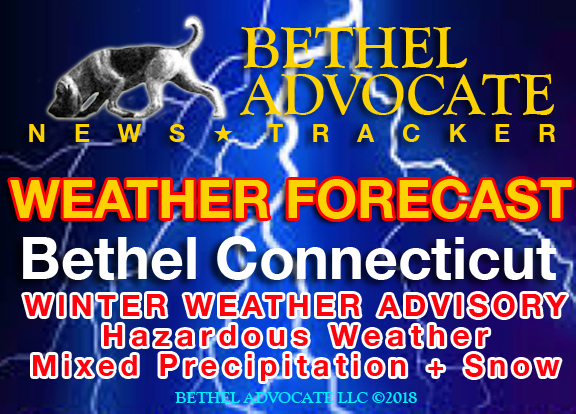 This Hazardous Weather Outlook is for southern Connecticut,northeast New Jersey and southeast New York. * WHAT…Mixed precipitation. Additional snow accumulations of up to one inch and ice accumulations of a light glaze. Winds gusting as high as 35 mph. * WHERE…Northern Fairfield and Northern New Haven Counties. Rain, freezing rain, and sleet before 10am, then a slight chance of rain between 10am and 11am. High near 41. Wind chill values between 20 and 30. Northwest wind 13 to 18 mph becoming west 7 to 12 mph in the afternoon. Winds could gust as high as 32 mph. Chance of precipitation is 90%. Little or no ice accumulation expected. Total daytime sleet accumulation of less than a half inch possible.